We’ve reached the fourth Sunday of Easter, so Pentecost is just a month away. There will be both an introit and an anthem this Sunday. I’m not sure what the introit will be. When we began going over “What Does the Lord Require” again last Sunday, “What Does the Lord Require” was going to be the introit, but it was decided that when it was done in the way we like to sing it, it is rather long for an introit. So “What Does the Lord Require” became the anthem instead. The opening hymn is “Savior, Like a Shepherd Lead Us,” hymn no. 387. This hymn is attributed to Dorothy Ann Thrupp (and was almost certainly written by her, but being modest, she explicitly took credit for few of her hymns). Born in London on 10 Jun 1779, she was the daughter of Joseph Thrupp. She was an editor for the Religious Tract Society and published “Savior, Like a Shepherd Lead Us” in a collection of her hymns: Hymns for the Young, first published in 1830. She died on 14 December 1847. The tune is the eponymous BRADBURY. 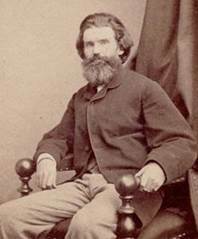 William Batchelder Bradbury was born in York, Maine, on 06 Oct 1816. In 1830, his parents moved to Boston, and he soon became known as an organist. Dr. Mason was leading singing classes at the time, which were very popular, and William Bradbury attended. He was then admitted to Mason’s Bowdoin Street church choir. 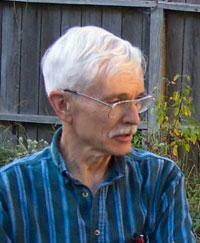 He next taught in singing schools himself in Machias, Maine, and St. Johns, New Brunswick. Then he became the Director of Music and organist at the First Baptist Church of Brooklyn which was followed by a position at the Baptist Tabernacle in New York City. He began teaching singing classes in New York City. He had a class of over 600 in the Spring Street Church alone. Then he produced a series of “Juvenile Music Festivals” at the Broadway Tabernacle, with a thousand children singing (two-thirds of whom were girls). It was said to be quite a sight to see 1000 children, all dressed in their uniforms, rise together at the beginning of the concert. William Bradbury wrote many Sunday School tunes for singing by children, and worked to have music taught in the public schools of New York City, an effort in which he succeeded. He also wrote the tune for “He Leadeth Me” and the tune for “Just As I Am” (words by Charlotte Elliott). William Bradbury died at age 51 on 07 Jan 1868 and is buried in Bloomfield Cemetery in New Jersey. The music is by Jim Strathdee (b. 1941). Jim and his wife Jean have a singing ministry. According to Jeanie Strathdee’s Facebook page, she is a fan of NPR and the Rachel Maddow show. 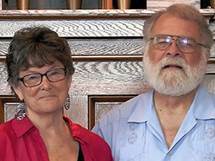 For many years, the Strathdees were directors of music at St. Mark's United Methodist Church in Sacramento, California. The music is made up of three interlocking melodies that form a quodlibet on the text. The gospel lesson is John 10:1-10. In 2015, on April 26, the verses following this lesson, John 10:11-18, were read. All eighteen verses are about sheep and shepherds. Sheep are not like most farm animals (hogs and cattle, for example), which have to be driven to get them to move from place to place (while saying “suee-eey” or “haw, cow”). 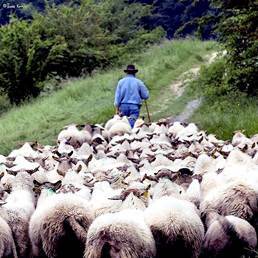 Sheep can be led. 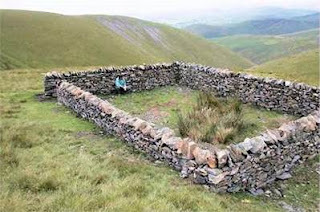 A sheep fold, with no gate or door. 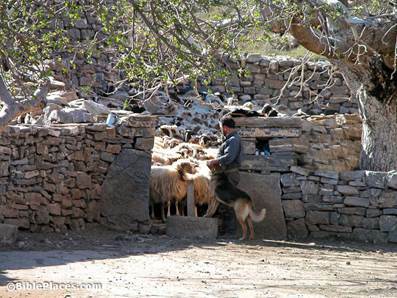 Shepherd acting as the gate of the sheep fold. 1 Peter 2:18 Slaves, be subject to your masters with all reverence, not only to those who are good and gentle, but also to those who are perverse. — nothing that would draw us to him. We despised him and rejected him. and was afflicted by disease. we have all turned to our own way. the punishment that all of us deserved. —for our faults struck down in death. and had spoken no word of treachery. “After all his pains he shall be bathed in light. He poured out himself and willingly gave his life. “The Lord’s My Shepherd, All My Need,” hymn no. 175, is the second hymn. The text, by Christopher L. Webber, is recent, 1986. Christopher Webber is a graduate of Princeton University and of the General Theological Seminary in NYC. He now lives in Sharon, Connecticut. He has written a number of books, including Beyond Beowulf, Welcome to the Episcopal Church, and Re-Thinking Marriage. He also makes maple syrup. When I was growing up on the farm, the question was not how did you get into the pasture, but instead, how did the bull get out of the pasture and into the neighbor’s corn field. When she was raised, she was taught it wasn’t polite to say the word “bull,” so she always called it, the “animal.” For some reason, males were generally allowed to say the word “bull” as long as there weren’t any women around. My brother and I were also taught not to say the word “belly,” only “tummy” and “stomach” were permitted. Parental standards seem to have grown substantially more permissive since my day. The hymn preceding communion is no. 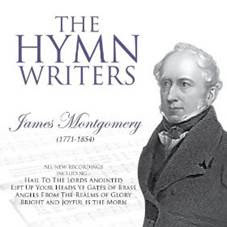 505, “Be Known to Us in Breaking Bread.” The communion hymn was authored by James Montgomery. It is sung to ST. FLAVIAN. The same tune is sometimes used with “Lord, Who Throughout These Forty Days,” (no. 81). The closing hymn is “Lord, Whose Love Through Humble Service,” no. 427. The instrumental music isn’t listed in the bulletin.